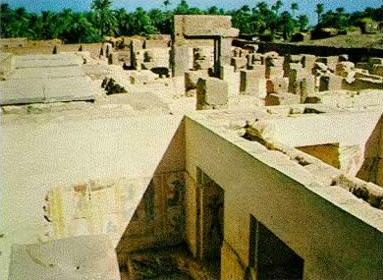 The temple of Ramesses II is a small temple that is northwest of the Temple of Osiris about 300m. The temple was built in 1298 BC for Ramesses' spirit to give him a close association with Osiris. It was originally built very well and contains work that is better than most of Ramesses' other monuments. The craftsmen were probably trained during his father's, Seti I, era. The temple is mostly in ruin except for the limestone walls which still contain brightly colored works. Napoleon's archaeologists reported that the temple was almost intact when they first saw it.